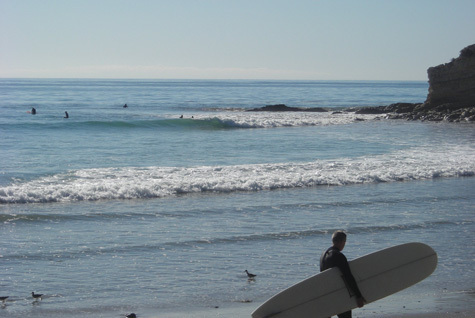 Lots of peeling 2 to 3 foot “in-betweeners” rolled in unridden throughout the weekend at the point just down the beach from our campsites at Refugio State Beach . . . Greg Cochran would have been all over them. Sunday night dinner at the Hollister Brewing Company in Isla Vista. 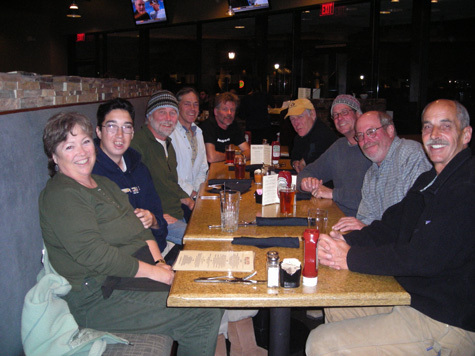 L to R: Diane Duncan, Brennan Duncan, Roy Earnest, Bob Lambertson, Tom Ferro, Sky Parsons, Tim Cissna, Mike Ryan, Dave Duncan. 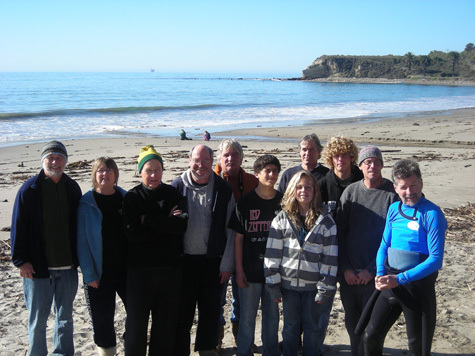 Dave saved a couple of parking spots earlier that day in the Day Use area at Hobson’s County Park for Tim and Bob and their entourage, so they could join him to surf clean 3 to 4 foot waves at the point break right out in front of the park. What a guy! Ridin’ with the King, Mike Ryan in a fast food delirium on the way home from Refugio. See what fast food will do to you?